Day 13- lucky us. The travel lift picked us up (well, we got off the boat) and brought Ms Newly Painted Bottom over to the well where we painted the areas where she’d sat on the blocks and stands. As soon as we finished- was the paint even dry? – in she went. The next 24 hours were to be loaded with high winds and rain so we opted to stay Tuesday night with the hope of heading to Dutch Island Harbor Wednesday afternoon. Our spot was next to the haulout well; for which we became very grateful quickly. Russ ran her while the two marina crew were on deck to guide her out of the slings and help toss lines to the two of us waiting at the dock. Heard the engines- no, that doesn’t sound normal- oh NO- “there’s no water coming out of the exhausts!” A few yards more and the lines were tossed; engines shut off. Too long on the hard is not good for Ms Ortolan. Both engines needed priming with a pitcher of beer (water actually) before they could drink on their own. No damage to the impellers or otherwise. After lunch on Wed we headed down to Dutch Island, an easy 17nm; the wind just off our stern; the waters of West Passage mere wavelets. Wavelets is a favorite word of mine and one I’d love to use more often. Gentle swells is an Ok term too; we found those and then some on Thursday as we – yes folks once again- sailed the 25nm from Dutch in to Block Island’s Great Salt Pond, aka New Harbor. The entire trip took 3 ½ hours so that means we averaged 7.1nm/hr. Not surprising since a few times near the end we saw 9+. 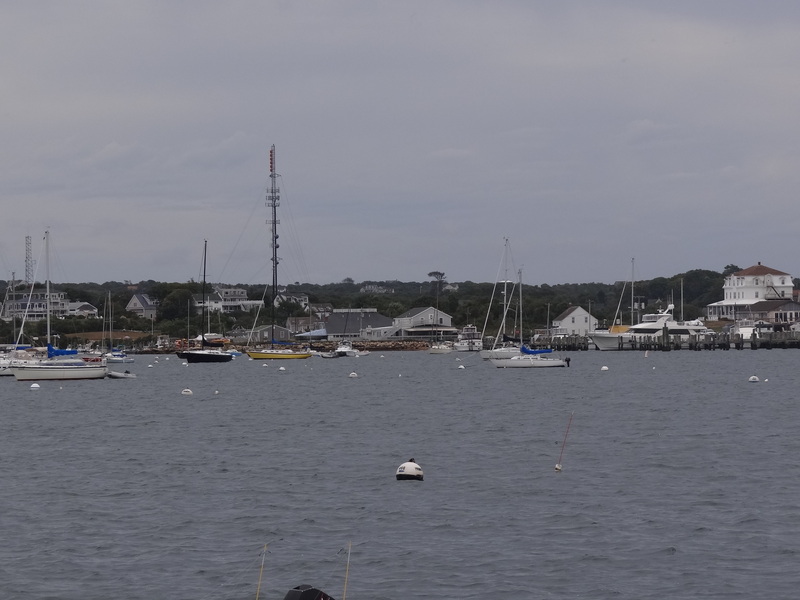 For those who have seen Block Island’s New Harbor, no doubt the memory is of a jam-packed, no moorings available, barely room to anchor harbor; in season that is. Hearing that it is mostly empty once high season is past is one thing; it’s another eye-opener to actually see it with a smattering of boats here and there. Oh and which spot shall we take at the always overcrowded dinghy dock? Um, this looks good- gee whiz we had our pick of everything, including a table at The Oar. Our much-desired Block items are Payne’s Killer Donuts and we’d been looking forward to them since last year, as in, the day after we left Block. 🙂 Did anyone see our expectant faces drop a foot when we read the sign, “Open 7a.m. Sat and Sun”? 😦 Hopes dashed- but wait- we could dinghy in Sat at 8a.m before we head off. Fresh, fresh, these are the best! Our depart time on Saturday was planned for 9:30; the current would be with us through the Race, LIS and the CT River- gee how often does that ever happen? The not-unexpected morning fog co-operated nicely; lifting by 9:15 with perfect visibility by the time we headed out. 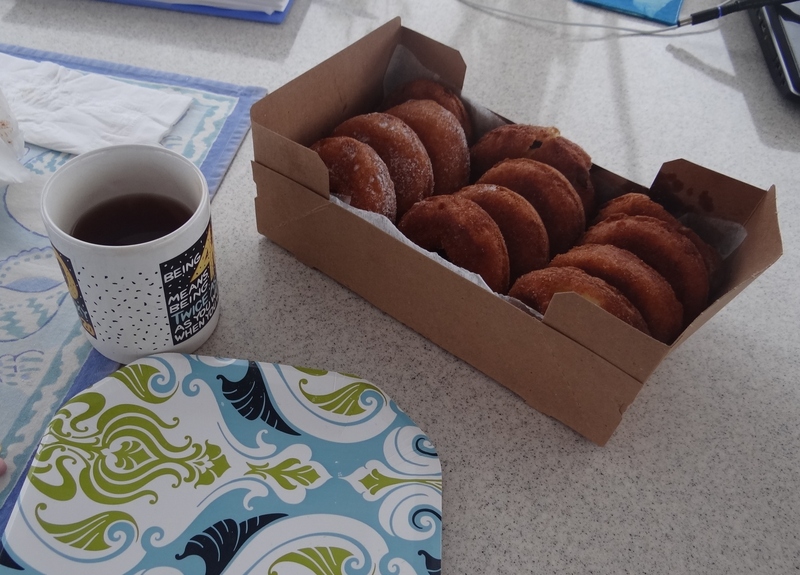 Tummies full of Killer Donuts, hopes full of sailing expectations; off we motored, and motored. Block Island Sound could only be described as near flat calm; wavelets you might say. Eyes peeled for sea turtles, only to be opened in surprise to see four or five dolphins a few miles out of Block. That sure sets a record for us. 12:30- began motor-sailing, 1:30- turned off those noisy engines and sailed with main and screacher all the way to the Old Saybrook breakwater.